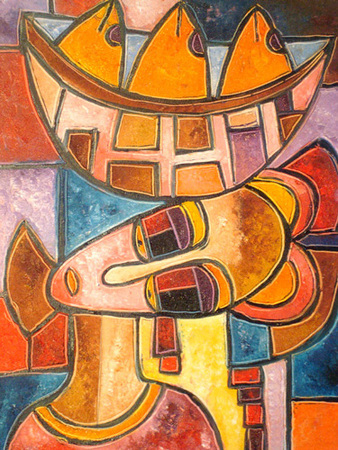 Rahmon Olugunna’s work is said to ‘evoke the fertile artistic landscape of Oshogbo’s cultural heritage and artistic movement.’ A third generation Oshogbo artist, Olugunna keeps pushing artistic boundaries with his abstract interpretations, set in a ‘mosaic of striking colours and patterns’ but maintains his passion to keep the intrinsic representation of Yoruba mythology and culture. Understandably, that is no surprise, for Oshogbo is renowned as the cradle of ‘Yoruba culture and spirituality.’ As his new collection, ‘New Currents from Oshogbo,’ opens at the Arc Gallery, London, Olugunna explains his creativity is not limited. Belinda: What is about Yoruba ‘culture and spirituality’ that inspires you as an individual and your artistic work? Rahmon Olugunna: Growing up in Oshogbo, I participated in Yoruba festivals as a drummer, which gave me insights into the culture. My mother’s family were drummers and performers, so I was exposed to the culture from an early age. Sometimes I draw on Yoruba culture and spirituality for the themes in my work but I present them through my own vision. Belinda: Your work has been exhibited on three different continents, in what ways have your travels and experiences influenced your work as an artist over the years? RO: Travel has exposed me to different art styles, which are very important for an artist. Seeing the work of other artists has also given me energy to think more deeply about my work. Belinda: Oshogbo is renowned as the ‘cradle’ of Yoruba culture and spirituality. However, there are other dialects/groups within the Yoruba culture. Why have you focused on expressing the intricate nature and existence of Oshogbo art through your work and why is it important to you that the cultural and spiritual elements come through in the work that you produce? RO: As an artist, I was taught by two members of the first generation of Oshogbo artists, Rufus Ogundele and Muraina Oyelami. This served as the foundation for my work. When I paint, I listen to that inner voice within myself which determines the approach to my work. 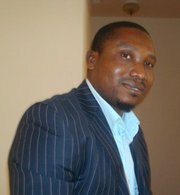 I am flowing with the current of the Oshogbo art movement but my creativity is not limited. Belinda: Would you say you have succeeded in creating a space for your work to be recognised and respected within the international artistic landscape though your work is from a different cultural and spiritual space? And how would you describe the current state of the artistic landscape in Nigeria? RO: In Nigeria there are many gifted artists but it is not easy to promote your work and make a living off your work. Hence, I am grateful for the progress I have made so far because many talented artists in Nigeria have not had international exposure. Belinda: Based on your travels, in what ways do you think they are leading or lagging behind in the artistic field/expressions? RO: Nigerian artists are not lagging behind Western artists. 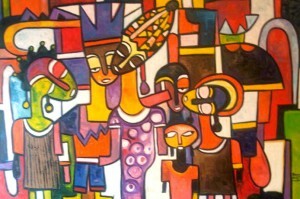 Nigeria is rich with artistic traditions and contemporary expressions of art and culture. Belinda: Are artists from the traditional and cultural and even spiritual perspective, from Nigeria or other African nations more daring today, and take the risk that you have or is it more practical to go with the popular song in order to break into the “quote-on quote” art world? RO: I can only say that I try to stay true to the voice within me that guides my work. Belinda: In what ways do you think art from Nigeria and other parts of Africa, over the years, given the fact that artists like yourself have the opportunity to cross over and show your work to new audiences in other countries, has succeeded in breaking down pre-conceived barriers about art from Nigeria/Africa? RO: My art attracts all kinds of people, who are open to what I have to share as an African artist. I would hope that this broadens people’s minds in regard to Africa and its rich culture. Belinda: What story/stories do you seek to tell through your paints/visual work off poetry? RO: I tell the story of how I view my inner and outer world. Belinda: What would you like this collection to evoke in the audience about Oshogbo, Nigerian and African and traditional forms of art that you are a champion of and why it should be embraced? RO: My work proudly represents Oshogbo, Nigerian and African art. I just want people to enjoy my work and to know that the Oshogbo art movement is still going strong, through the work of the original masters and upcoming artists like myself. All images are copyright of Rahmon Olugunna. This entry was posted on Tuesday, May 17th, 2011 at 11:50 pm	and is filed under Africa, Art and Culture, Interviews, Journalism, Nigeria, People. You can follow any responses to this entry through the RSS 2.0 feed. You can leave a response, or trackback from your own site.